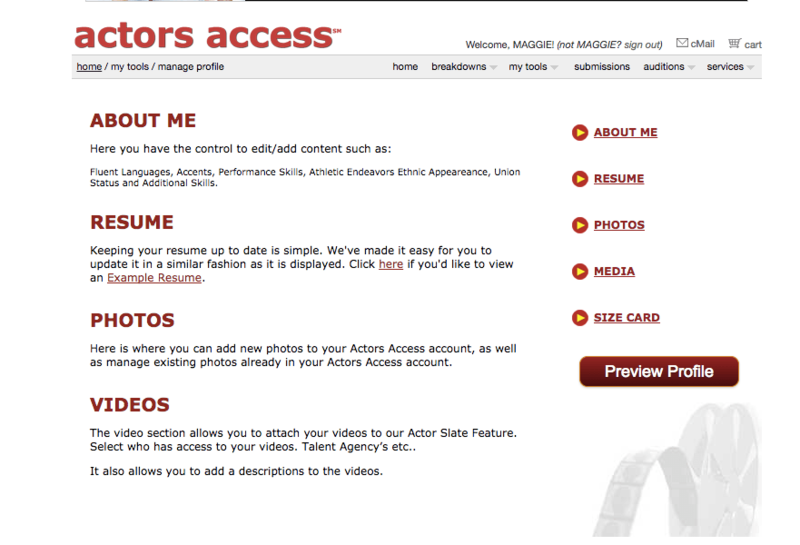 Actors Access is an online platform that allows actors to maintain profiles by uploading headshots, updating their resume, adding new skills and attributes, managing performance videos, and more. Created in 2003, Actors Access functions like a virtual database between casting directors and aspiring actors looking for jobs. Casting Directors have the option to release Breakdowns to actors and receive submissions directly from them. Actors Access has proven to be one of the most efficient ways for me to successfully receive audition appointments and book jobs. Here are some easy tricks to get your Actors Access submissions noticed. Your first 2 photos you can upload to your profile are free. When submitting on projects, your photo shows up to the casting director in a square thumbnail. Casting directors may receive hundreds of submissions for each project - choose and crop your headshot wisely. According to Breakdown Services owner Gary Marsh, "your pictures should look like you do when you walk into that casting office. If you’re a woman and you spend a lot of money getting your hair and makeup and then do a session, you better be ready to go in as that when you walk in to audition." Updating your resume is free of charge. If you add a SlateShot to your profile, your name gets shuffled to the top of the pile (Actors Access has a generated system of sorting submissions for casting directors). A SlateShot is a 7 second video clip that brings your headshot to life. Each headshot you upload can have its own SlateShot. Casting can watch the attached SlateShot to hear what the actor really looks and sounds like. Another way to get shuffled to the top of the casting director's list is to include video in your submission. For a one time payment of $22 per minute, upload performance videos to add to your profile. When submitting on specific jobs, choose the video(s) you'd like to include to create a custom reel. Have a special skill that's valuable to casting directors? Put it on video! The goal is to catch the eye of the casting director while demonstrating your skills in under a minute. Start by losing the title card. List your information (name, title of piece) on the lower corner of the video to save time. Keep your videos short and to the point. Sure, having video helps. But poor quality may be a tell tale sign of a green actor. When including video, ask yourself if it represents you in the best light (literally). Personally communicate with the casting office here. Casting directors can receive thousands of submissions on a single breakdown. What makes you perfect for this role? Think height, special skill, local hire, relationship with the creative team, etc. Casting director Paul Russell explains that the notes feature "offers actors an opportunity to ‘push’ as agents do. Push yourself. Be smart, not clever with gimmicks. Be brief. Be concise. Be you." Though each submission on Actors Access is $2 each, the charges add up quickly. If you are submitting a video as well, it is another $3. If you find yourself submitting frequently, I suggest if subscribing to Showfax for $68. 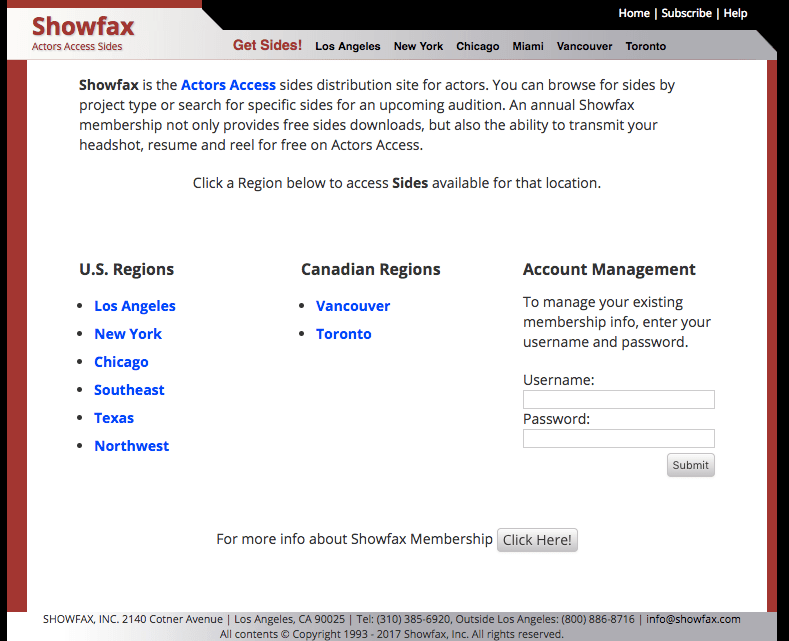 According to the site, "an annual Showfax membership not only provides free sides downloads, but also the ability to transmit your headshot, resume and reel for free on Actors Access." Always note the submission deadline listed on the breakdown. Casting can be a time crunch. Stay on top of the breakdowns as they are released. Ah, my favorite part of Actors Access. Casting directors use Cmail to contact actors on auditions, callbacks, bookings, etc. It is important to stay on top of things, especially when casting is time sensitive. Hook up your Cmail account to your email and never miss a message.